Students from St. Anne’s RC High School in Manchester celebrate being crowned champions of the North West as they go on to represent the region in The Prince’s Trust Enterprise Challenge National Finals 2019. They successfully fought off tough competition from the other top finalist schools in the region, beating pupils from Manchester Academy, Our Lady’s High School and Fred Longworth School. 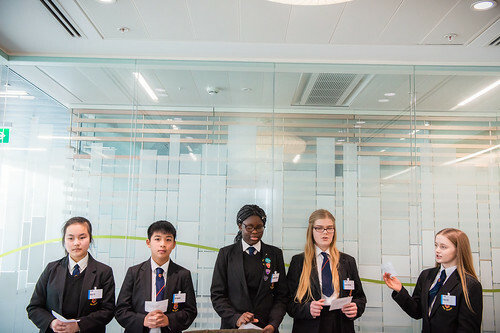 Momen, Joshua, Ruby and La’Wayne (all aged 13-14) – collectively known as Team Better Stockport – went on to win the North West Enterprise Challenge 2019 held yesterday at KPMG in Manchester. The team won the judges over with the social enterprise idea of creating a Bike Security System app – helping to keep the community safe while improving the health and fitness of young people and reducing carbon emissions. The students pitched their social enterprise ideas, Dragons Den-style in front of highly acclaimed judging panel from a spectrum of backgrounds that included: Andrew Stone, Director Business Restructuring – KPMG, Sarah Driver, Enterprise Advisor and Luke Swann, Director – The Prologue. Keynote speaker on the day was Social Mobility Commissioner and Founder of Xplode Magazine, Saeed Atcha MBE. Recently honoured in this years Queen’s Honour’s List 2019, Saeed also returned as a past fellow Enterprise Challenge mentee; who’s team came third in competition in the year they competed. “This feels like such a once in a lifetime moment for us and don’t think any one of us thought we would get this far – let alone win! Thank you so much to our amazing mentor Andrew. We’re so excited for London.